A death in the family « Hercules and the umpire. Nearly 20 years ago when Joan and I bought our present home we had six magnificent Scots pine trees on the south end of the property. The had been planted in the ’60s and were fully mature. One of them was so large at the base that it would require three big men with long arms to encircle it. And then in 2000, at the beginning of the new millennium, a deadly disease, Pine Wilt, began to kill our pines and thousands of other throughout Nebraska. The following is a brief explanation from Backyard Farmer. By the way, BF is produced by the University of Nebraska and it is the longest running TV lawn and garden program in America. 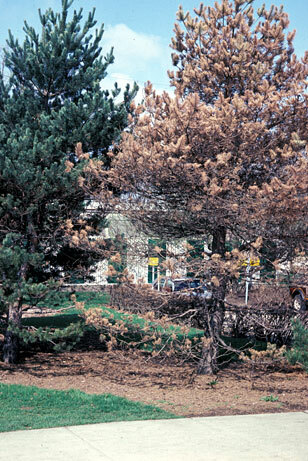 Scots pine, a non-native pine that has been widely used in Nebraska windbreak plantings, is facing a serious, new threat called Pine Wilt, which is caused by the pine wood nematode, Bursaphelenchus xylophilus. This nematode is unusual, compared to other plant-parasitic nematodes, because it lives entirely in the above ground parts of the tree and never enters the soil. The pine wood nematode is a microscopic, worm-like animal that feeds on the living plant cells surrounding the water-conducting tissues of pine trees. Once inside a susceptible pine tree the nematodes reproduce rapidly, and move throughout the tree. As they destroy the water-conducting tissues the tree’s water-moving system becomes clogged and resin flow slows, then stops. The tree then begins to display wilt symptoms and soon dies. This wilt typically kills Scots pine within a few weeks to a few months. 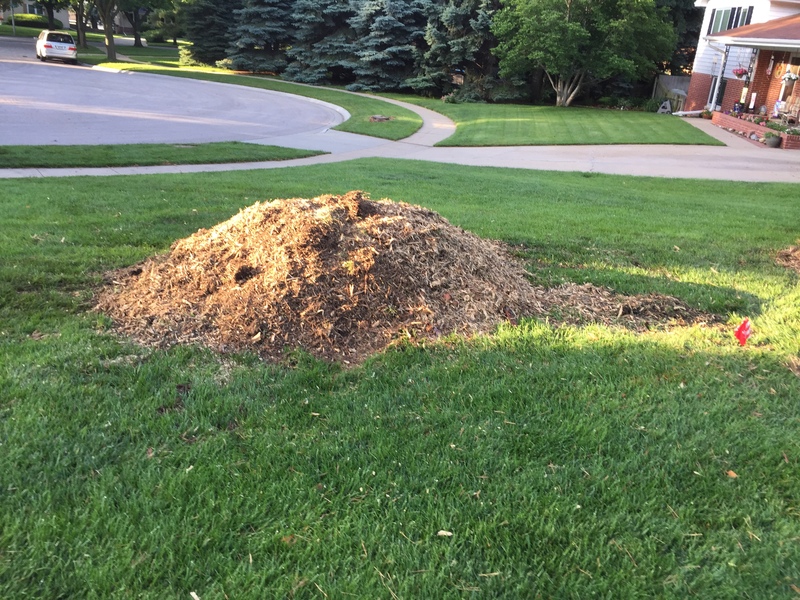 I suppose that I can be accused of hyperbole, but the loss of the last of these wonderful trees–particularly the giant–was like a death in the family. Maybe it is true that I like trees more than people, but that is a topic for another day. For now, I need time to mourn. As you mourn, or after mourning and when you are able, contact the Arbor Day Foundation. Order as many seedling trees as you are able to plant, and put them in the ground. Care for them. Nurture them. Talk to them. And when you are old — and they are reaching “middle age” (whatever that is for a tree) — your family, your neighbors, your friends, and unknown others will honor your love of trees by doing the same — in memory of your efforts to better our earth. Trust me. I know about this kind of thing. I owned an acreage at 96th and the Roca Road for many years. Planted seedling trees by the dozens where only crops and native grass had grown before (which I had also planted, but that’s another story). I have not been out there for a while, but when last I was there, it was a forest. Sorry for your loss, I love my trees and know it is such a loss. Plant a nice 5-6′ Austrian-they grow like a weed and will be 20′ in less than 2 yrs. I couldn’t remember the exact quote, but, you are right, I thought someone else would surely repeat it. You did. How’s that for spin! In addition to everthing else you are an aborist, proving once again that you are smart as whip. But, talking Joan into Austrian pines will be a task. Be well, my friend. Nature does teach us what it means to be human. Although sometimes her lessons are harsh. But then again this might not be the right time to do so. Give it a few days.